The decade ended with tears from Mike and me. Sadness and fear and trepidation hung thick in the air. The holidays were a mixed bag. We had our own emotions, while our close friends had some devastating lows and dizzying highs – all at once. We are all ready for a change. The dawn of the new decade found me laying down, unmotivated to get up for the majority of the day. Late in the afternoon, I felt a strong urge to get some air, so Mike and I took Rigby outside. While Rigby did her thing, I looked up at the sky and gasped. We rushed to the roof (don’t tell Dr. Risky) so we could take it all in. It was a beautiful pink and purple sunset. When I think of my daughters, I think of pinks and purples. I miss my girl so much it’s almost suffocating. I think all the time about what she’d be doing, what she’d be saying, how we’d be preparing her for her little sister. I know I’d be doting on her during her last month as an only child. As I mentally prepare for her sister’s birth, I keep flashing back to hers – the day I became a mommy. It’s all going to be emotional and wonderful and bittersweet. I am so excited to mother again, but…it’s all just very hard and heavy. As the year and the decade open before me, I am still going to take it day by day. Hopefully I will see more beautiful pink and purple sunsets to keep me going. I’m praying for you and Mike. .-= InDueTime´s last blog ..A New Year With New Beginnings, Take Three =-. You are such a strong and beautiful woman. May your special sunsets keep you peaceful. .-= Rachel´s last blog ..Is this thing on? =-. Hold on to the beautiful things, they sustain us through the ugly times. Peace, courage and strength to you, and hugs as always! That is an incredibly beautiful sunset. I can see why you gasped. I’m glad you listened to your “strong urge to get some air”. As they say, timing is everything. .-= catherine lucas´s last blog ..A new year is lurking… =-. .-= Kelly´s last blog ..Artiste =-. Without a doubt that sunset was meant for you. A symbol of beautiful things to come. Wishing you love and peace in 2010. ABSOLUTELY! It took my breath away. What a breathtaking photo. I can only imagine what it looked like to see it with your own eyes. You, Mike, Maddie, Binky and little Rigby are in my thoughts and prayers. (((hugs))) and love to you guys. Beautiful! I think she knew you needed to have a lil’ peace with that breathtaking sunset which, in its beauty still is dim to that beautiful smile. Even though I don’t “know you” and never knew Maddie, I feel like I know her more than some family members. What a lucky little girl to have parents to share her with the world. To share her story, her smile, her eyes, her joy, her pain, their pain. I thank you for sharing her with me. I carry her in my heart and as my 2 year old runs around I think of Maddie and instead of telling him to stop (some of the time), I run with him. I run with him because I can. For him. For me. For You and Mike. For Maddie. She reminds us all how short life can be and to live everyday as if it were the last. I think with her preemie status, she showed you that from the start and you have more to share because of that. Wow, what a great comment!! I wish I could say it as well as Angela did!!! Beautiful comment. I truely believe Maddie sent that sunset just for you. Thinking and praying for you and Mike. I agree with Laura! Beautiful comment, Angela – wish I could’ve said it as well. Yes, I believe as Elizabeth does – Maddie sent that sunset just for you guys. I also believe she sent Binky, as a present to help you through the grieving process. Love and prayers to you all! I also believe that beautiful sunset was a gift to you from your sweet Madeline. She continues to bring those precious pieces of light to you and Mike. Your family is never far from my thoughts. Thank you for sharing your life with so many. It has made a difference in the way I live my life and I continue to tell others around me about your courageous journey and about your little Maddie. She is always with you. Many, many hugs. Not a mother again – you have been a mommy since the day you committed to Maddie during your first pregnancy. You’ll always be her mother; still, a mother. I think she meant “mother” the verb- but your comment is so sweet. Of course Heather will always be Maddie’s Mommy!! No matter what!! That was a “Maddie sunset” for sure,,,with all of the pinks and purples! I don’t know you personally, Heather, but my heart positively breaks for you, and the tears flow, as you talk about how sad you feel. It has to be one of the most devastating losses a person could ever go through. I hope that when precious little Binky makes her appearance in the world, and you are cuddling with her, that you will feel Maddie right there with all of you. I cannot wait to see pictures of all of the happiness taking place. Hugs to all of you, sweetheart. I am choosing to believe that the purple wrapped around the pink is a symbol of Maddie wrapping her lovely spirit and heart around her baby sister. She is protecting her and has helped her to stay in that belly for 34 (THIRTY-FOUR!!!) weeks and counting (stay put, Binky Bean!!). I also think that such a beautiful, breathtaking sunset was somehow a sign to you. That Maddie is speaking to you, and telling you that she will always be a part of her sister, and that she wants her to be just as lucky and loved as she is by having a life as blessed as hers was. Like somehow she is saying that it is ok that you are letting another little angel into your lives and hearts. I don’t know…. it just seems that those colors, the way that they are intertwined, the fact that you just happened to go outside just in time to see it…. it had to mean something, and I love, love, love that you saw it, and that it took your breath away. Both of your little baby girls will forever be changing the world and taking people’s breath away with their beauty and grace…..Just like their Mommy does! I agree with Laura (well said! ), and had the exact same thoughts about your dear Maddie. It is a stunning picture and I gasped as well, at the sight of those purples intertwining with the pinks. God Bless. Love to you guys – I think of Maddie whenever I see purple too – you see it more during winter than you’d think – I hope for you a lighter, so much happier New Year – and Maddie will be with you all the way. What a beautiful sunset. I really hope you and Mike see many more beautiful reasons to keep going. .-= Lynn from For Love or Funny´s last blog ..Revenge is like fine wine… =-. A beautiful sunset for a beautiful family. Day by day is all that you can do, and sometimes when days are to big to think about, minute by minute. You are doing great. What an amazing sunset, the colours are just so stunning (and wow you captured it so well). How appropriate for you and Mike to see the purple and pinks on New Year’s Day. O Heather your words are so moving today and as always bring tears to my eyes. Thank you for continuing to share so much with your readers. You continue to be such an inspiration to us. What a beautiful sunset for a beautiful, sweet girl. I will never see another pink and purple sunset without thinking of Maddie, now. .-= ClassyFabSarah´s last blog ..2010 Giveaways =-. Heather, you are a strong, amazing woman. I always wish I could say something useful but there are just no words. Absolutely beautiful… everything about this post took my breath away. Happy 2010 to you and your family… you’re always in my prayers. .-= Lisa Marie´s last blog ..Love Remains the Same… =-. Hugs & love to you Mama. There’s a reason you had a strong urge to get air…your girls wanted to give you both their gift to you and remind you to breath and tell you…it’s gonna be okay. Gorgeous, just like your Maddie. I hope the new year brings your family much comfort and happiness. I think of swirly pinks and purples when I think of Maddie too. Love you, girl. There is simply nothing I can add to this beautiful post and picture – which quite literally took my breath away – except my continued prayers for love, peace and support for the four of you. I’ll be looking for those sunsets here in Texas and sending your way…. Beautiful post and gorgeous picture – a gift from your Madeline to you and Mike! Can’t ever begin to imagine what you’ve gone through and continue to go through but do want you to know that you have a lot of love, support and prayers surrounding you. Every time I dress my daughter Ainsley in Purple, I think of your daughter and ask her to watch over my little girl. Praying for you on this new year. This is just about the most beautiful post to read first thing in the morning. Your girls are truly special – just like their parents. .-= Colleen´s last blog ..Things I learned on this last vacation… =-. I have nothing more to say than I love you and your family, Heather. Peace to you today. That is a beautiful picture! No doubt…Maddie had a hand in that! She knew her Momma needed to “see” her! ;) What a precious and perfect gift!!! That’s a Maddie Sky, sent to you, Special Delivery, from the artist herself. Telling you, every little thing is going to be okay. That sunset is absolutely breathtaking. .-= Corinne´s last blog ..It would hurt not to blog this =-. Breathtakingly beautiful picture and post, yet once again. You guys are still in my thoughts and prayers every single day. Beautiful, just beautiful. Maddie knew you needed a little reassurance and made that sunset just for you. You guys are always in my heart and in my thoughts. .-= Lisa´s last blog ..Happy New Year =-. That sunset is all Maddie. All of it. She was spreading a blanket of love over the Spohrs. May 2010 bring you and Mike nothing but joy and happiness. .-= Karen Chatters´s last blog ..Who’s her daddy =-. maddie made that pink and puple sky just for you. she knew you would need a pick-me-up. so she created just for you guys. i think she did a fantastic job…what an artist! .-= michelle´s last blog ..New Year’s Eve! =-. Hugs and love to you and Mike. You guys are in my thoughts and prayers. Sometimes the signs are all around us, they’re just difficult to see. Maddie wanted to make sure that you saw that one. What an amazing little girl. I read your words and think just how full of love her life is. And you didn’t stop being a loving mama on April 7; you and Mike are always Maddie’s parents and the love your family has for each other continues to thrive. It may be love on a different plain, but that doesn’t lessen its strength. Binky is coming into a wonderful loving family and is already blessed more than she may ever realize. May her arrival be right on schedule, and may this year be full of joy for all of you. I really think it’s going to be easier than you think when Binky gets here. I really do. She won’t fix the pain but that conflict and confusion will sort itself out a little. Going forward with Bink doesn’t mean leaving Maddie behind. Maddie will always be Binky’s sister and she will know all about her. And you will always be Maddie’s mommy. And doesn’t it have to get a little easier when it’s not the first year? Rhetorical but sheesh the anniversary stuff is rough. Sunset pic is spectacular. Hugs. That sunset has Maddie written all over it. She’s still with you. .-= Rebecca´s last blog ..the first (few) days of the rest of our lives =-. OMG Heather–that pic is so beautuful! I can’t stop looking at it! Wishing you much joy in this new decade! Wow, that sky is amazing. .-= Midwest mommy´s last blog ..A Not So Easy Bake =-. I have been reading your blog for a while but this is my first time commenting. That picture is absolutely beautiful. I showed it to my whole family. May you & Mike have a happy 2010. You are always in my prayers! God Bless. You are doing great, Heather. Just keep putting one foot in front of the other. I can’t imagine how hard it all must be. It’s hard to look at that picture and not think of Maddie. Even though I am not religious, I can’t help but think she had something to do with that gorgeous sky. I am so glad you were able to capture it. Happy 2010! May it exceed all your expectations. Gasp-worthy photo, H. Gave me spingles. .-= Angie [A Whole Lot of Nothing]´s last blog ..hump it, rub it, hump it again • GRAMMAR NERDGASM =-. .-= kris´s last blog ..52 Photowalks… =-. .-= Heather´s last blog ..New Year….New puppy =-. I thought of you and Mike on New Year’s Eve and knew how difficult it would be to leave 2009. Big hugs to you both. Beautiful! Here’s to great things for your clan in 2010! WOW… I LOVE sunsets and taking pictures of them. This is one of the most beautiful ones i have seen! It was meant for you to see. The skies were showing you the beauty of your daughters through nature. Congrats and keep your chin up! The sunset is gorgeous. I can only imagine how complicated your feelings must be right now. You seem so very strong. May you see many more beautiful pinks and purples in the sky to remind you of both your daughters. .-= Stimey´s last blog ..They’re Even Squirmier Than I Imagined =-. Beautiful…simply beautiful. I believe that Madeline sent you that sunset to help you & Mike be at peace and to find comfort. She is still with you and always will be. I am praying for you and your family and may 2010 and all the years to come be filled with happiness and blessing. That sunset was yours. A sign from above when you needed it. I don’t believe in coincidence because I have had similar “signs” far too many times at the exact moment I desparately needed them. Our family is also expecting a baby, and I have such high hopes for this child and the hope it will bring. We NEED ours, just like you need Binky. There will be many bittersweet moments, I know. The tears will still flow. But these new babies will bring so much healing. I know they will. Here’s to 2010 babies, and the wonderful things they will bring with them. ~Praying for you daily. Thanks for sharing your signs with us. Heather I do hope 2010 is just full of good things for you. You don’t deserve anymore pain. Tears for you today from another stranger lifting you up from far away. Even though we can’t get what we want, we do sometimes get what we need. And what soul doesn’t need a sunset? .-= Ms. Moon´s last blog ..It’s Cold =-. wow. This gave me chills! .-= Dawn´s last blog ..Yeah…what service is he providing? =-. God and Maddie sent that sunset for you, which is why the urge for you to get out of bed was there. Maddie was there, shining down on you, with her beautiful purples and pinks. Take care, guys. Always thinking about you. .-= Mary @ Holy Mackerel´s last blog ..I May Just Be The Miraculous Virgin Mary =-. Wow, that is just breathtaking! I am sorry it’s so hard–I can’t even imagine…many hugs to you and your hubby. .-= Sarah R´s last blog ..Happy New Year, everyone! 2010 will bring me my baby girl… =-. That’s Maddie! Shining down her love for you and Mike on what she knew was going to be a hard day. That picture gave me goosebumples! Maddie is always with you and she is giving you beautiful and gentle reminders of that always. I am continually thinking of you and your family! .-= Michelle Pixie´s last blog ..2010 =-. So beautiful! Though I rarely comment, I read your blog and think and pray for you daily. You’re handling this beautifully though I doubt you give yourself credit for it. I see purple where I never did before. And it always conjures Maddie. .-= Susan´s last blog ..I’m Not So Proud =-. I haven’t been by a lot lately, but you and Mike and Maddie have been in my thoughts the entire season. Much love to you. You have all been in my thoughts lately, hoping for a little peace and joy for you. Everytime I see purple I am reminded of Maddie. I hope someday to have a little girl as wonderful as she is. .-= Camie´s last blog ..Year’s End. =-. So there you have it!! Maddie is one of “God’s best Angels” and she colored that beautiful sunset just for her Mommy & Daddy!! May Maddie send you lots and lots of Pink & Purple sunsets to share with her little “Binky” sister! The view from your roof looks so beautiful. Palm trees are amazingly and makes me feel so warm and at peace and wonderful. Maybe Maddie painted that sunset just for you and Mike. Heaven’s angels have special privileges you know. That is breath-taking. A beautiful tribute to both your daughters in the sky itself. What an amazing picture. Keeping you and Mike in my thoughts during this time. .-= mstomrs´s last blog ..29 and feeling fine! — Updated =-. That’s quite a photo — amazing, actually. It’s so beautiful. Just like Maddie. Just like Binky. Breathtaking sunset. Gorgeous just like Maddie. Can’t even comprehend how much you miss her, that precious little angel! You will Heather, I promise, you will. What an absolutely breathtaking sunset! Just like Maddie…breathtaking! beautiful…. Happy New Year to you and your whole family.. If you look in the sky in the middle of the pinks and purples there is something along the shape of a heart! Maybe the sisters know each other more than anyone else will ever know! They are both blessings from above and this is a sign showing how sweet the coming of Binky is! Binky will be a light for you. She will never be Maddie, but she’ll grow your love. .-= Alicia @bethsix´s last blog ..TweetFaves: A Six-Month Retrospective =-. .-= Zakary´s last blog ..For Auld Lang Syne =-. 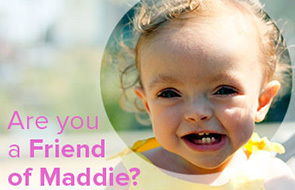 When I read about Binky, my thoughts follow your post today, namely, that her birth will be bittersweet — a joyful blessing that should be shared by Madeline as well. I can see how that sky puts you in mind of your girls. Sunsets make me a little sad because their beauty is ephemeral. I always watch until the sun gathers in the last rays of light and dips below the horizon, wishing that I could hold on to its brilliance just a few moments longer. There is no better reminder that Madeline is everywhere than that purple, glowing sky. I am thinking of you, and wishing for a year filled with promise and hope for your family. Oh, Heather! I hope you frame that nice and big for Little Sister’s bedroom! That is just . . . totally sent from God to you! .-= Maria´s last blog ..New Year’s Quiz 2009 =-. You have never, not for one moment, stopped being a mother. I am so excited for you to have a child to hold again. I always pray for you, but yesterday during church you were specifically on my mind. I have no idea what joy and peace look like after what you have suffered, but I do hold on to the hope that you will find them. .-= Kelly´s last blog ..‘Plans’ =-. Heather, I haven’t commented many times on your blog, but I do read it most days, and so I thought I’d leave a kind word thanking you for sharing your life, pain and all, here on your blog. I think you know how easy it is for somebody to feel so connected to the people and family behind a blog even though they do not personally know them. I guess I’m just trying to say that your family is always in my prayers and I so appreciate your wonderful honesty and powerful thoughts. I can’t wait to meet Binky! And I am always so happy to see every day or so when I check your blog that she’s healthy and still gestating! I hope 2010 is full of hope and happiness for you guys. What a sweet daughter you have, giving her mommy and daddy such a gift. I am amazed. What a beautiful sunset. I love that Maddie sent that to you. Love you lady. .-= Kim´s last blog ..Jeopardy =-. That IS a beautiful sunset. I’d like to think it was no accident and that Maddie was trying to send you a sign that she’s okay. and I still pray for you and mike daily. .-= designHer Momma´s last blog ..Out with the Old, In with the New =-. What a special gift Maddie sent you! I don’t know how “heaven” works, but I just have to believe that we continue on after our bodies die on this earth. I just have to believe that Maddie is still moving among you and in your lives, and that she sends little miraculous hellos to you exactly when you need them. I am thinking of you often as you walk through these days. .-= Kelley Land´s last blog ..It’s on Me =-. It’s not a sunset; it’s a sunrise. A beautiful one. .-= Undomestic Diva´s last blog ..The Postcard Project for Anissa =-. If that isn’t a sign… I don’t know what is. .-= Rumour Miller´s last blog ..Not me Monday =-. That photo took my breath away and brought tears to my eyes. I’m so glad you got the air you needed. Beautiful. Truly a gifted moment. .-= Princessjo1988´s last blog ..Honesty, a picture or two and 4 years. =-. yeah. we don’t get stuff like that in Indiana. That’s all for you baby. However when you’re done being diabetic I have a fried oreo with your name on it. What a stunningly beautiful sunset. Thinking of you and praying for a peaceful mind and heart during these exciting and impossibly hard days before the birth of your 2nd daughter. .-= Kristin´s last blog ..Bits of this, Bits of that =-. Oh Heather, I hope you guys have many beautiful sunrises too. I will never let a sunset go unappreciated again. Thank you for sharing. .-= Sarah Bellum´s last blog ..Old People are Ruining the Universe & my Life =-. So gorgeous! What a great gift from Maddie. .-= Melanie @ Mel, A Dramatic Mommy´s last blog ..2010 Reading List =-. Whenever I get a ‘sign’ like that I call it a God-incidence. I am not as religious as I am spiritual but events like that are truly magical. .-= Vaness´s last blog ..Things on my mind… =-. Oh mind blowing, really some beautiful scene on sunset. .-= chandan´s last blog ..Search work at home opportunities at digital point forum =-. I hope you do, and I hope 2010 brings you nothing but happiness. .-= Michele´s last blog ..Article on Feeding Solids =-. Beautiful, Heather. That heavenly sunset is Maddie ringing in the new year and telling her mommy & daddy that she’s there with you and looking forward to her sister’s arrival. Gorgeous. I also can see that as a Maddie-sent sunset, to let you know she is watching over you all. May there be much pink and purple in the year and years ahead. The mornings have been beautiful, too. When I see this sky, I point it out to my kids, think of my Daddy Bill’s favorite color (sky-blue pink), and now think of Maddy. I think of myself as an only child but my parents lost a 27-month-old baby boy four years before I was born. His name was Mike and I grew up seeing pictures of him on my mom’s dresser and my dad’s desk and hearing about the brother I never knew. I must admit that I used to hate Mike. My parents got sad when they talked about him. He was a boy and I suspected that my parents would have preferred raising a boy rather than a girl. The way they described him, Mike seemed perfect. I never heard about him being bad and having to be punished. In my parents’ memory he was perfect while I, on the other hand, caused them all kinds of stress. In addition to being angry at Mike, I was afraid of him. Before I was old enough to understand that he was buried in the cemetery I was afraid that I might find his body in a drawer or a closet. Even when I realized I wasn’t going to stumble on his corpse, I was still afraid that whatever it was the killed Mike would get, me, too. Once I had babies of my own I understood my parents’ anguish. To my father’s credit (my mom died before I had kids) he never compared my sons to Mike, at least not out loud. I know how horrible losing Maddy was for you,. I guess I identify with Binky and I feel sad that she’s going to grow up hearing about a sibling that she never knew. I’m sure you’ll do a great job of making Binky feel loved and welcome. I’m just saying it’s hard being the child who survived. Oh how sad! But I am sure that H&M will do Maddie justice while never letting Binky feel like a “replacement.” I think things were different a generation ago in regards to child-death & how it was handled by hospitals, families, and additional children within the family. I’m sorry you spent your childhood afraid of your older sibling! However, you will always be someone who can really connect with the “new siblings” in families such as this. .-= Mary´s last blog ..Uninspired? =-.